Whatever your views, if the opportunity to change Irish politics is there, I think it should be grasped now. It seems that many of us elected as independents share a common objective of ending the iron grip held over the political system by the main political parties. Opinion polls indicate that NOW could be the time for a breakthrough. Speaking to TheJournal.ie this morning, Ross stressed that the move was “exploratory”, and played down talk of a formal alliance or new party before the next general election. I don’t know what will come of this, but hopefully it will be something constructive. The local elections showed an upsurge in protest against tribalism, and I want to see if there is an interest out there in radically changing Irish politics. “We’re not looking towards the general election yet,” he said, but added that he was seeking a “common crusade” among independent elected officials. Independents are a very disparate group, but I see no reason why on some issues we couldn’t all form under one umbrella. I won’t be meeting with him. I’m already working with others on the Left to form an alternative. 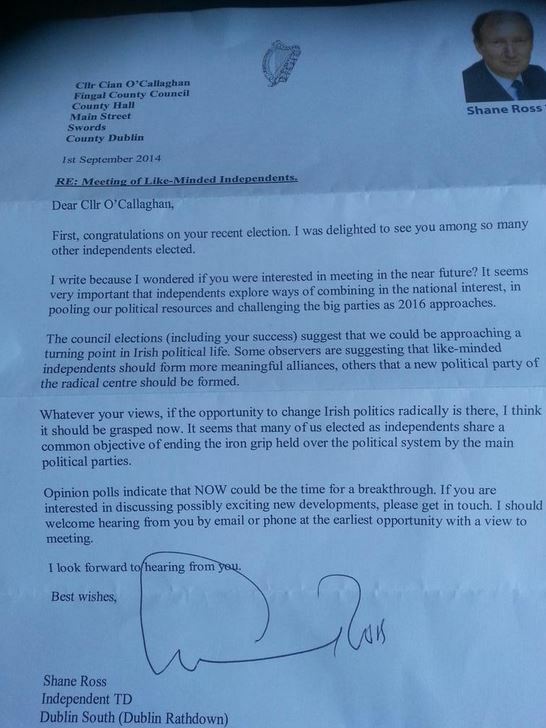 In Limerick, independent councillor John Gilligan also received the TD’s letter. I would always consider myself a republican socialist, but I wouldn’t be totally against an alliance of independents. The approach of the big parties seems to be to isolate independents, unless you’re their puppet, so it mightn’t be a bad thing to have a coherent voice, at least on certain issues. Ross’s letter this week comes after a consultation process which began earlier this year. In February, TheJournal.ie reported that Ross had sent an email to a handful of trusted supporters, asking for their advice on whether the time was right for a new political movement. The Independent Network, a loose alliance of left-leaning independents, met before May’s local elections to share campaign advice and support. Both Shane Ross and Stephen Donnelly TD, were represented at the workshop. Email “READ: Shane Ross calls on independents to 'change Irish politics radically'”. Feedback on “READ: Shane Ross calls on independents to 'change Irish politics radically'”.